Ever just feel like everything in the world is against you? Most of time it’s the really small things that get us down and give us that impression. I’m writing this in advance of it being published and by the time it goes out I’ll be getting ready to leave the flat for the walk in centre. A while ago I was composing a list of things it would be good to get for the flat and included on that list was a new kettle. The one we have is over three years old and basically as cheap as a kettle can be but it still does its job and works okay. Turns out it got a bit leaky though and as I was pouring kettle water around last night it trickled out and landed on my foot. Luckily I had a sock on so it isn’t as bad as it could be but it’s super painful and does need looking at. But it’s just one of those things where it seemed to be okay and then bam it decided to not only prove me wrong but injure me in the process. It’s also the same day as I put some nail varnish on in the morning and thought I could get away with leaving putting a top coat on for a few hours. I’d already forgotten to put a base coat on which was a sign things would go badly and sure enough by the end of the day they were absolutely ruined and needed re-doing. And then this cold Monday morning at 6am I get woken up by the binmen contracted out by the council. I got to sleep about an hour beforehand so feel pretty grumpy. It’s against regulations here for them to collect rubbish so early as they are naturally doing a loud job that can disturb people however because it’s a private company it’s harder for the council to enforce than when they used to run the services itself. So now I have a bad foot and am super tired. It wasn’t all bad though as yesterday I did get to see a good friend I haven’t seen in quite a while and have a catch up and general chat about life. 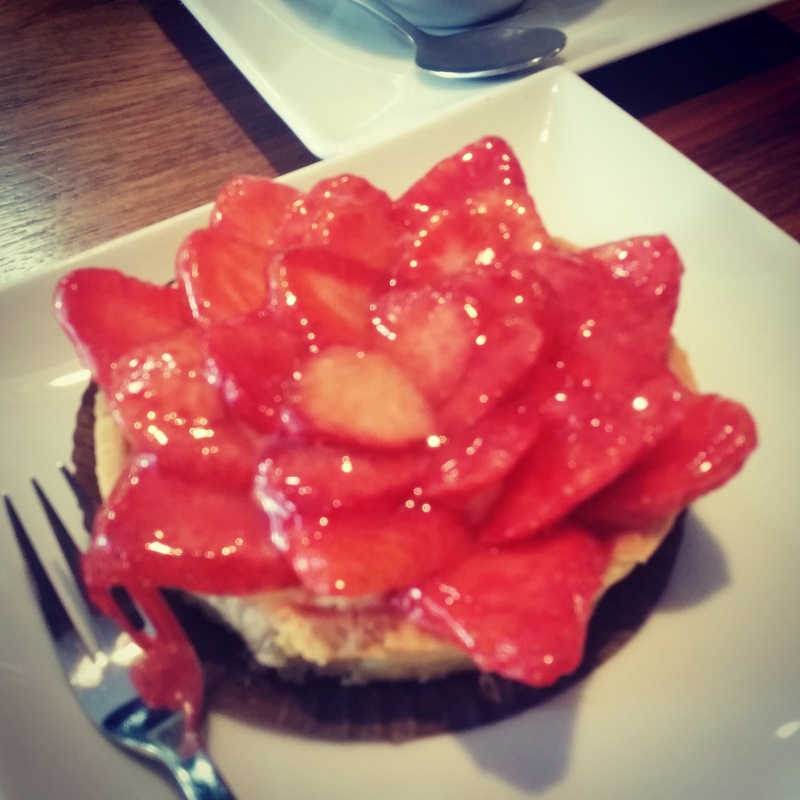 Plus I got to have a glazed strawberry tart which was super yummy and tasty. And I was pretty pleased with my eye make-up. But also the stress of life and everything that keeps coming at me and going wrong is really starting to screw my body up. My hair normally goes more blonde in the summer but there are bits going blonde right now for no reason and I’m terrified they’re going to appear grey one morning. My skin is becoming a nightmare and always the first thing to show my signs of stress and worries and maintaining it is proving to be an impossible mission which is annoying because nice eye make-up is ruined by a messy face. My weight is all over the place, with my eating habits, but I’m unable to motivate myself to eat well or the right amounts and it really concerns me all the stress and downward emotions are having serious impacts on more than my mental wellbeing. And also I’m starting to wonder what a good nights sleep even is anymore and most of my blog posts for the last couple of weeks got written and scheduled at about 4am after I couldn’t get to sleep (or not for more than about 15 minute intervals). I don’t feel beautiful inside or out and my mental health continues to decline (not that I honestly thought that was possible) and now I have chipped nails and an unconvincing looking foot. I think I might ask for a simple and more stress-free life for Christmas – reckon that’s possible? This entry was posted in Health, Lifestyle, Mental Health, My Life, Physical Health and tagged bad luck, Beauty, beauty blogger, beauty bloggers, body, boiling water, cake, depression, eating, fashion, food, friends, good luck, habits, hair, hot water, injury, kettle, lblogger, lbloggers, life, Lifestyle, lifestyle blogger, lifestyle bloggers, living, Mental Health, shopping, sleep, tired, town. Bookmark the permalink.